New Boston’s Taylen Hickman starts her swing on Wednesday evening. New Boston’s Kaylee Stone begins to go around with the bat on Wednesday evening. Clay’s Jensen Warnock stands in at the plate. RUBYVILLE — When a deep and talented unit puts together its very best out on any field of play, the results are usually of the scary variety. 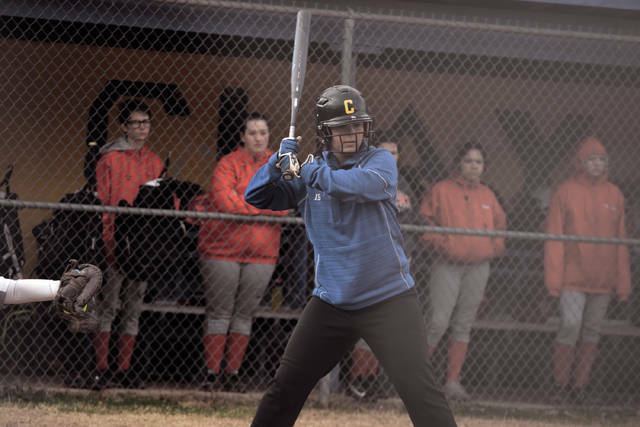 On Wednesday evening, that fact was proven again as the Clay Panthers’ softball program, behind perfect 3-for-3 days at the plate from leadoff hitter Shaelyn Vassar, three-hole hitter Jensen Warnock, and nine-hole batter Kat Cochran, along with a towering two-run home run by Julia Swain, collected 16 hits as a unit en route to a 14-2 victory over the New Boston Tigers’ softball program on Wednesday evening in Rubyville. For Jason Gearheart, the performance was excellent to see — especially against a well-coached and much-improved New Boston program from prior seasons. As for Brian Holbrook, his Lady Tigers were simply thrilled to see time on the dirt with Millbrook Park — which sits in a low-lying area to begin with just off of U.S. 52 — seeing water problems due to the heavy and persistent rains that have fallen throughout much of the regular season to this point in time. The Lady Panthers, who batted in the top half of each inning as the away team during the affair — which was supposed to be played at Millbrook Park but was moved to Clay due to the high water conditions — embraced the gusty winds and chilly weather conditions from the very beginning as Clay jumped right out of the gate to take a 1-0 lead following a pair of singles by Vassar and Warnock and a wild pitch that brought the former on in. However, Clay didn’t stop there. After Hannah Oliver led off the second inning with a single, the junior advanced to second on a groundout, then scampered on home via an RBI single from Cochran that increased the margin to a 2-0 tally. A single from Vassar then moved Cochran up to second, and the latter came home on a passed ball. When Lila Brown drew a walk on a full count, that brought up Warnock, who scored both Vassar and Brown on a double that was rocketed to the center field fence as Clay took a 5-0 advantage. For the contest, Vassar accumulated a double and three runs scored while Warnock collected a pair of doubles, four RBI, and two runs scored. The pair’s efforts at the top of the order were only equaled by Cochran at the bottom of the order, as the freshman added a double, two RBI, and two runs scored on her own 3-for-3 day at the plate from the nine-hole to round out a 9-for-9 afternoon from the trio. 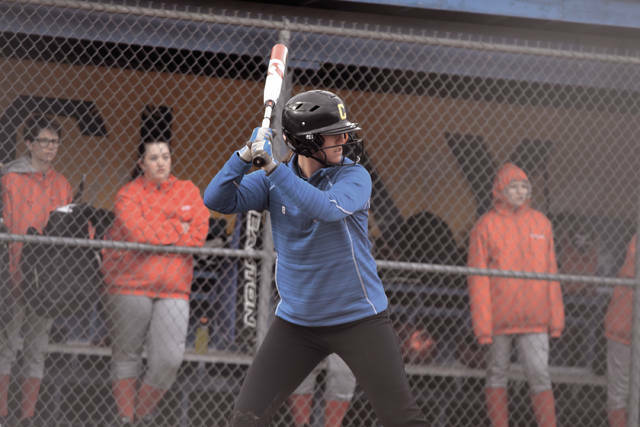 In the third inning, an outfield error allowed Cassidy Wells, the leadoff hitter in the third stanza, to reach base for the Lady Panthers, which allowed Oliver to bring Wells on around with a single back up the middle of the diamond. Three batters later, Cochran again answered with an RBI single to score Oliver and Vassar followed with a double that hit high off of the center field fence to put herself and Cochran on second and third, respectively. After an infield single by Brown that plated Cochran, Warnock then continued the hit parade with her second two-RBI double in as many innings as Clay took a 10-0 lead, and Swain capped the six-run inning off with an RBI double to left to score Warnock as the Lady Panthers ultimately obtained an 11-0 advantage after three innings of work. However, to New Boston’s credit, the Lady Tigers didn’t hang their heads. In the bottom of the fourth inning, Kaylee Stone launched a leadoff single to the right side to put New Boston in business, and, after advancing to second on a groundout, scored standing up on a rocket of a shot into the right field gap by Peyton Helphinstine. Helphinstine then scored on Lexus Oiler’s single back up the middle two batters later as the Lady Tigers closed to within 11-2 after four innings of play. Stone, who put together four groundouts and caught three additional fly balls from her shortstop position, was particularly impressive on the defensive end of the field, including a nice stop where the senior, on a well-hit ball from Megan Bazler, caught the ball on the short hop and fired over to first in an impressive play. 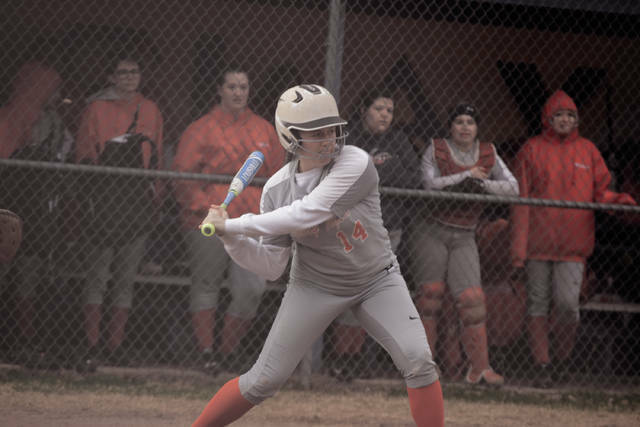 Helphinstine also had an additional hard-hit ball in the first inning that was caught in the outfield on what would’ve otherwise been an extra base hit, while Oiler and Taylen Hickman each collected a hit during the contest. Morgan Rawlins was also lauded for her play behind the plate by Holbrook. But Clay was determined to not let the game go the full seven innings. After an error allowed Sophia Gatti to reach base, Swain blasted a pitch well over the left field fence — with the ball coming down on top of the soccer netting at the youth soccer field that sits adjacent to the softball complex — to put Clay up by a 13-2 margin. 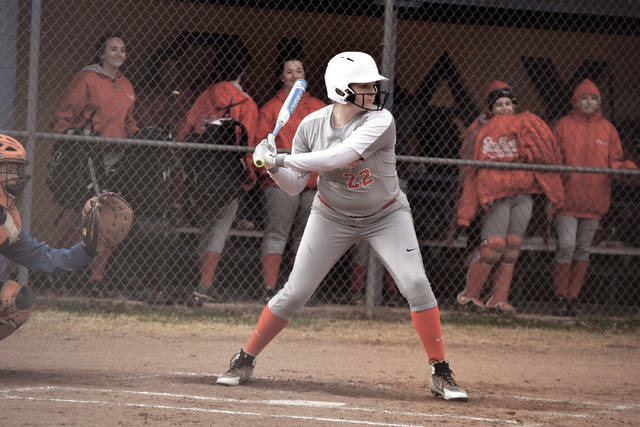 MeKenzie Loper added a single, and, after advancing to third on a double by Oliver, scored on a sacrifice fly RBI by Bazler to close out the scoring with the Lady Panthers — who played as the away team in the affair — taking home the 14-2 victory in five innings. Swain mixed in the late two-run homer and an RBI double to go 2-for-4 with a run scored, while Oliver (3-for-4, double, RBI, two runs scored), Brown (1-for-2, RBI, walk, two runs scored), Loper (1-for-1, three runs scored), Munion (two runs scored), and Bazler (sacrifice, RBI) rounded out a strong lineup performance from top to bottom for Clay. Even without much field time, there’s plenty of hope for New Boston — especially considering that the Lady Tigers don’t lack for bodies. A total of 19 players are available for Holbrook, who likes the potential that he sees with a more sizeable roster. As for Clay, the hitting performance only solidifies what Gearheart already knows.